Emotional expressions on Greek tombstones from the Hellenistic period (323-31 B.C.) help increase our understanding of social communication and cultural values. This is the conclusion of a doctoral thesis in Classical Archaeology and Ancient History from the University of Gothenburg. 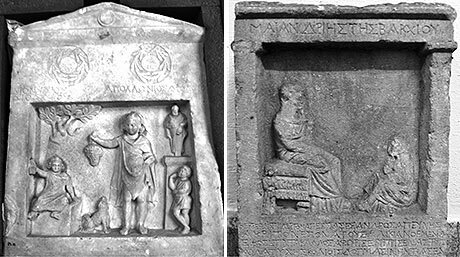 Doctoral student Sandra Karlsson has studied ancient grave reliefs from the Greek city-states Smyrna and Kyzikos in present Turkey. The reliefs display both figurative motifs and inscriptions. ‘This source material provides important information about funerary rituals, demographics, family structures and ideas about life after death,’ says Karlsson, who chose to focus on expressions of emotions, but also conceptions of death. Despite the potential of the tombstones as a source for history of emotions, this has rarely been explored by researchers. One of Karlsson’s conclusions is that the illustrations and inscriptions reflect people’s way of relating to death, and that the tombstone was a means to deal with the grief of losing a loved one. Another conclusion is that emotional expressions on the tombstones also indicate social values, where individuals with low status are more likely to express grief than people with higher status. Grave reliefs were expensive and the deceased probably belonged to the equivalent of a middle class. The dead were often portrayed with their servants and family members. While the family members are lined up next to each other like statues, the servants perform various gestures signifying mourning and grief. For example, they may sit on the ground or touch their chin with one hand. Previous research has pointed out that the high child mortality during Antiquity contributed to cultural conventions that suppressed expressions of grief at the death of a child. Karlsson finally concludes that emotional expressions on the studied tombstones become particularly evident when unconventional elements were added, such as a touching description of a deceased or a child portrayed with his or her favourite toys. A desire for a more personal expression can often be noted. ‘Kind of like modern obituaries where the cross is often replaced with more personal symbols like a heart or a football. Or by posting a photograph of the person on the tombstone,’ says Karlsson.